Social media is not complicated. There may be people who want to make it look that way because it helps them make money. Or there may be people who make it look that way, because they themselves are looking at it the wrong way (Brian Solis, Jeremiah Owyang). I have been in the communications business for 25 years and I have always seen my job as creating simplicity: to take a complicated thing and reduce it to its essence, be that an essence expressed in a few words or a definition of basic principles. So here is my simplicity manifesto for social media: a reduction of seven years of thinking into 10 core principles or statements. Social media is a big thing, because it represents an unstitching of the relationship between information and distribution formed by Gutenberg in the 15th century. This relationship has defined the world that has emerged in the centuries since, not just in terms of shaping the media, but also shaping things as important as science and banking. It is not just about Facebook and Twitter. Marketing, like everything else, grew-up in the Gutenberg world, where information was imprisoned within expensive means of distribution: the world where we could therefore only perform in front of audiences. This world hasn’t gone away and brands still need to perform, but a new world has emerged within which information is liberated and where it is now possible, in fact necessary, to create cost effective relationships with individuals and small groups. Audience-based (i.e. high reach / low engagement) approaches will not work in this new space, nor can you make this space work by trying to build audiences within it. The only way to make the space work is to understand how to create vastly greater value (high engagement) from contacts with much smaller groups of people or individuals (low reach). Almost any form of content – i.e. 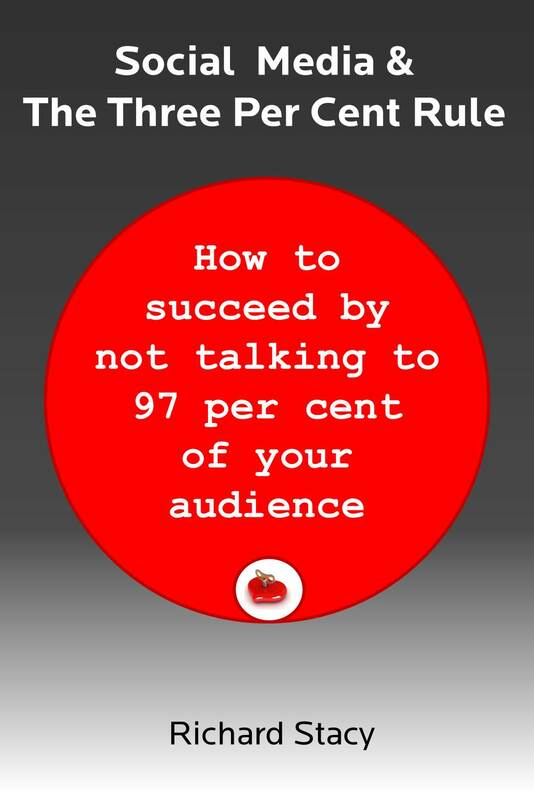 a single piece of communication designed to be seen by an audience of people – will fail to create sufficient engagement. You can create relationships of the necessary value by understanding the role of Superfans and the Gang of Ten. Superfans are a tiny group of people who can none-the-less be motivated to deliver huge value to your business (albeit not by representing your business to an audience). The Gang of Ten is defined by those people who, at any one moment in time, are seeking a response from a brand. This Gang is defined by behaviours – what they are doing – not by who they are or the channel / place they sit within. The Gang will potentially be drawn from your whole audience, rather than a fixed and defined segment within it, but they will only ever be a small number at any given time (ie. they are not simply a small, fixed, audience, not should they be treated as such). Consumers and customers are happy to be treated as a member of an audience, (and brands must not abandon this space) but when they want to be treated as an individual, they will expect brands to be able to respond to this. The response they are looking for is the expectation that brands will listen to them and answer their questions. They are not looking for content in this space, they are looking for information and recognition. The challenge in the audience space is defined by channels and messages: the challenge in the world of the individual is defined by behaviour identification and response. This means that an audience strategy was all about communications outputs, whereas a strategy for the world of the individual is all about behaviours and processes (see point seven). Social media needs to be understood as a business process, which can be applied to any area of a business, not just marketing or communications. The starting point needs to be a definition of the specific business objectives you want to use social media to support. Social media cannot support marketing objectives (because these are defined by the need to reach audiences) but it can help make marketing achieve its objectives more efficiently. People and behaviours, therefore processes, are the key to successful social media strategies. Tools are much less important (and you should never base a social media strategy upon the desire to use certain tools or a quest to find the perfect tool). The people challenge is usually solved via decentralising activity to the front line of a business, with the central role shifting from being a message production and management role, to a process design and facilitation role. The single most important function, upon which all other social media activities should be based is listening / monitoring. A real time monitoring dashboard is therefore the most important tool (or set of tools) to create. Intelligence from monitoring should inform any content or information strategy and this should be seen as a real time response process, rather than programme of scheduled editorial. Finally, remember that there is a confederacy of interests out there which will, consciously or otherwise, always be trying to lure you away from doing the right thing. These are the people, organisations or practices that have a stake in the ways we do things in the world of the audience, and will want to try and export these ways into the world of the individual in order to preserve their relevance. The social digital space is totally different to the traditional communications (and digital) space. Therefore, simply doing a variant of what it is you do (or did) in the traditional communications space – be this a form of activity or a form of measurement – will not work. December 16, 2013 - 11:48 am Pingback: Can marketing become an enabler for genuine engagement?